If you have any questions that are not yet answered below, just drop us a line. We’re located in Austria, CET time zone. NEED TIPS TO GET STARTED? 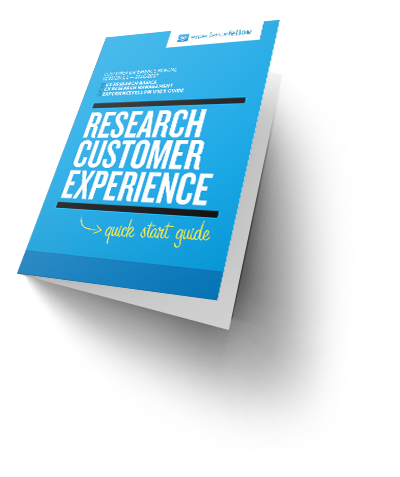 The short guide leads you through the software and explains how to create a research project in ExperienceFellow. Is there a free trial before paying? with your first name, organisation name, and email. No credit card details needed. What happens to my data after my trial is finished? If you don’t delete your account after your trial has ended, we will keep your data for 3 months. However, you can’t access the data until you upgrade to a monthly plan. Deleting your account is possible at any time. Do you offer a white label version? Yes, we do. You can request a unique branded version of the ExperienceFellow mobile apps. If you’d like to have your very own mobile ethnography app powered by ExperienceFellow, get in touch with us. You can download all your invoices from within the app. Simply click on your user name in the upper right corner and go to “Billing History” to see and download any invoice. If you just signed up, you might have to wait a few days until your invoice will be online. Just click on “forgot password” under your login. If one of your co-workers lost their password (and you’re the admin of your organization), you can send them a password reset mail from “users in organization” section. How can I up- or downgrade my account? Accounts based on monthly plans can be up- or downgraded any month. If your account is based on yearly payment, please get in touch with us. What if I don’t want to use ExperienceFellow anymore? If you decide to cancel your subscription, you can do so within your account settings. If I cancel my account and sign up again later – will my data be stored? No. If you cancel your account, your data will be deleted entirely from our servers. At More Than Metrics we take data security seriously. We use 256-bit SSL encryption for all transactions. Billing information is never stored on our servers and securely handled by Braintree Inc. which is also trusted by airbnb and Uber. We keep our system up-to-date on any security patches for operating systems and server software as well as our software itself. We only process data to store and provide it to the researchers of a specific project. Only you as a researcher can access and decide what happens to the data your participants collected. However, it is also your responsibility as a researcher to make sure only data that you are allowed to collect is gathered. If your company has got custom guidelines that we need to sign on, feel free to get in touch with our CTO Klaus directly klaus@experiencefellow.com. He is also happy to help you out with any security related concerns or questions that you might have. Can I run ExperienceFellow on my own servers? Theoretically yes. However, this would only be possible in combination with a white-label version of the mobile application. Please consider if you can and want to take care of first-level support, data center security, external access, frequent updates, and maintenance. If you're still interested in hosting it on your own servers please get in touch with us. How can I learn more about the software? Feel free to schedule a demo with one of our team members here. The ExperienceFellow guide can be an introduction to working with ExperienceFellow. If you want to learn more about features we recently launched, have a look at the EF blog. What languages can I use in ExperienceFellow? The ExperienceFellow mobile app is available in English, German, Spanish, French, and Italian. The language automatically adapts to the standard language of the respective device. If the standard language is set to a language not supported yet, ExperienceFellow mobile app will default to English. The web-based app is available in English only. Please implement this or this and that feature. I really need it! We appreciate your feedback! Please let us know about your wishes and ideas at mail@experiencefellow.com. Can ExperienceFellow be used with a tablet or mobile device? The mobile app can be used on any tablet or phone with iOS or Android. The web-based app works best on your PC. What happens if I archive a project? Archiving a project means that the respective participants no longer count on your billing volume. By default, archived projects are not displayed on your dashboard. There is no time limit for archiving a project as long as you have an active ExperienceFellow account.